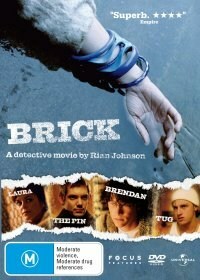 Brick is the latest masterpiece from writer/director Rian Johnson whose modern-day noir mystery tells the tale of Brendan Frye (Joseph Gordon-Levitt), a student at a Southern California high school. When Brendan receives a strange phone call from his ex-girlfriend Emily (Emilie de Ravin) who has been missing for over a month, he vows to find her whereabouts with the schools “brain”, played by Matt O’Leary. Rian Johnson really puts the genre on its head when Brendan ventures into the dark world of the school’s elites and drug users that opens a Pandora's box of secrets. His investigation soon leads to murder as he spirals into this never world of dark secrets, only to make the strangest allies with rich girl sophisticate Laura (Nora Zehetner) and the Pin (Lukas Haas) where he must gain their acceptance before placing the pieces together on where is Emily. Beautifully directed by Rian Johnson with exceptional acting by Joseph Gordon-Levitt and Lukas Haas, two individuals whose lives are intertwined.